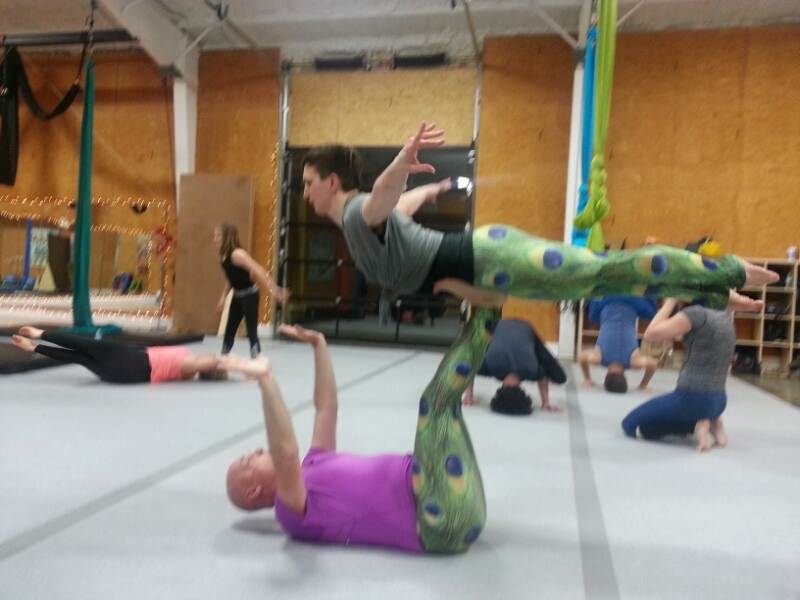 Acro-Balancing tonight. It was fun, although quite challenging at times. I discovered that being all legs makes mounting more challenging, but balancing easier when you’re the flyer. It makes being the base kinda weird sometimes — thigh stands are okay, but short arms and long legs makes a steep mount in foot bird or candlestick. Ballet also makes a lot of it easier — if you have a good arabesque, you know how to use the muscles in your back for the foot bird. I also discovered that I can still do a tripod headstand forever and ever and do cool stuff with my legs during. I’ll have to see if I can get my handstands back. They are awesome for for stability and balance, and I think that would be handy (no pun intended, I swear) for partnering.